One thing for sure is that Roberto Luongo and Tim Thomas won’t have a chance to play together. 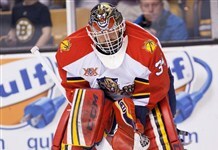 The Florida Panthers traded veteran goalie Tim Thomas to the Dallas Stars in a swap of goalies that sent to the Florida Panthers Dan Ellis. Seen as a possible trade of backups, Thomas was playing mainly in the role of no.1 goalie in South Florida until yesterday’s Roberto Luongo trade. Thomas who is now 39 signed with the Panthers prior to the seson start, a one year term at 3.75 million dollars. Thomas took last season off for family reasons and chose to sit out. With the Panthers this season, Thomas had a .909 save percentage with a 2.87 goals against average in 40 games played. Thomas well-known for his championship with the Boston Bruins has also won the Vezina trophy twice and the Connie Smythe as the playoff MVP in 2011. As for Ellis, with the Stars he recorded 5-6-0 in 14 games played while producing a 3.04 goals-against average and a .900 save percentage. In Florida, he will back newly acquired Roberto Luongo. Longtime rumored forward Tuomo Ruutu from the Carolina Hurricanes was traded today to the New Jersey Devils. In exchange for Ruutu, the Carolina Hurricanes will receive centre Andrei Loktionov and a conditional third draft pick in the 2017 NHL Entry Draft. Ruutu, who has scored 5 goals in 57 games played is in the second year of a four year term worth 4.75 million dollars per season. Drafted ninth overall in the 2001 NHL Entry Draft, by the Chicago Blackhawks, Ruutu played in 606 games recording 138 goals and 186 assists. As for Loktionov, a player seen as a third liner or a fourth liner has had limited success in the NHL with the Kings and the Devils. In 135 career games, Loktionov has scored 19 goals and recorded 19 assists. Loktionov was drafted by the Los Angeles Kings in the fifth round (123rd overall selection) at the 2008 NHL Entry Draft. In a pair of deals defensemen changed teams on this trade deadline day. First the Boston Bruins acquired from the Philadelphia Flyers defenseman Andrej Meszaros for a third round draft pick. Meszaros who was rumored most of this season to be traded will bring stability on the blue line for the bruins while adding some roughness. Meszaros known to block shots will be somewhat replacing the injured Dennis Seidenberg for the Bruins. Meszaros scored five goals and produced 12 assists in 38 games for the Flyers. he is currently in the last season of a six-year 24 million dollar deal signed prior the 2008-09 season. He will be an unrestricted free agent on July 1st. Meszaros was drafted by the Ottawa Senators in the 2004 NHL Entry Draft 23rd selection. Throughout his career spent with the Senators, Philadelphia Flyers and Tampa Bay Lightning, he has scored 54 goals with 165 assists in 571 games played. In another deal, the Edmonton Oilers have sent veteran defenceman Nick Schultz to the Columbus Blue Jackets in exchange for a fifth-round draft pick. Schultz recorded only four assists this season. This season for Schultz is the last one of a six-year deal at an annual average salary of 3.5 million dollars. Nick Schultz will become an unrestricted free agent July 1st. In his career, Schultz has scored 27 goals with 118 assists in 871 games played. he was selected 33rd overall at the 2000 NHL Entry Draft. In a pair of moves involving goalies, some teams made some stability deals on this trade deadline day. First the Calgary Flames have sent goalie Reto Berra to the Colorado Avalanche in exchange for a second round draft pick in 2014. Playing in 29 games this season for the Flames, Berra had a .897 save percentage with a 2.95 goals-against average. Drafted in the fourth round by the St-Louis Blues in the NHL Entry Draft of 2006, Berra saw limited playing time behind goalie Karri Ramo. In another move involving goalies, the Buffalo Sabres have sent newly acquired Jaroslav Halak with a third draft pick to the Washington Capitals. Going to Buffalo are Michal Neuvirth and newly acquired from the Phoenix Coyotes – Rostislav Klesla. Halak was acquired by the Sabres, last friday from the St-Louis Blues that sent Ryan Miller to St-Louis. In 40 games this season Jaroslav Halak had a record of 24-9-4 record, with a 2.23 goals against average and a .917 save percentage. Halak was sharing the duties in St-Louis with Brian Elliott and and is due to become an unrestricted free agent on July 1st. 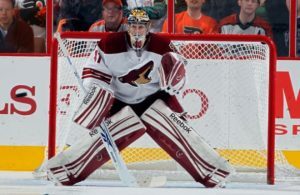 Selected in the ninth round at the 2003 NHL Entry Draft by the Montreal Canadiens, Halak has played in 260 games compiling a record of 139-81-26 record with a 2.38 goals-against average. The other goalie involved going to Buffalo is Michal Neuvirth. Neuvirth posted this year a record of 4-6-2 record in 13 games for the Caps. Neuvirth who was unhappy with his playing time in Washington requested a trade earlier this season through his agent. His save percentage was at .914 save percentage and a 2.82 goals-against average. Neuvirth is on a first year of a two year deal signed in the off-season worth an annual salary of 2.5 million dollars per season. The other significant player in the trade is Rotislav Kleslawho was acquired from the Phoenix Coyotes with Chris Brown and a fourth round draft pick. With the Coyotes, Klesla recorded 1 goal and 3 assists in 25 games played. Klesla is in the final year of a three-year deal worth an average annual value of $2.975 million. He will be an unrestricted free agent on July 1st.